a shot of the old Pure station around 4500 Warwick Boulevard and the wonderful brick station in Hilton ..
now used for something else. 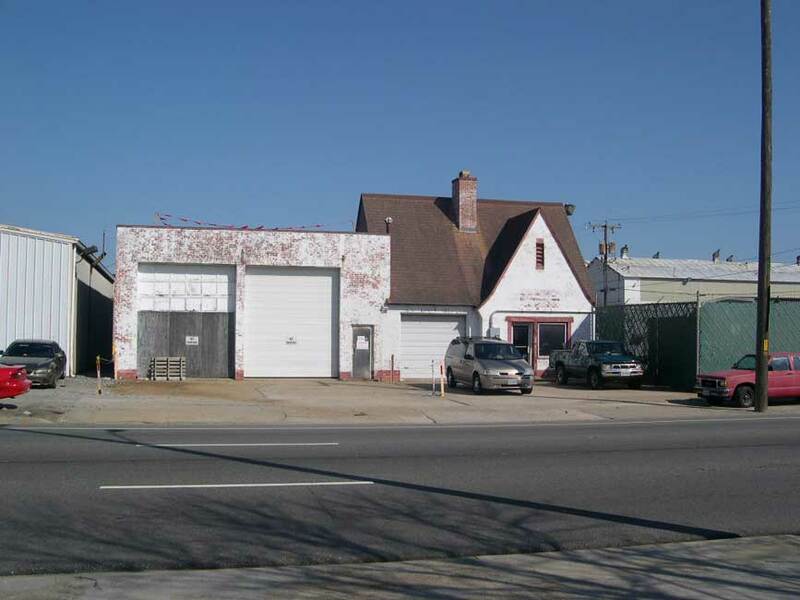 This is the old Pure Oil Co. station at about 4400 Warwick Boulevard. 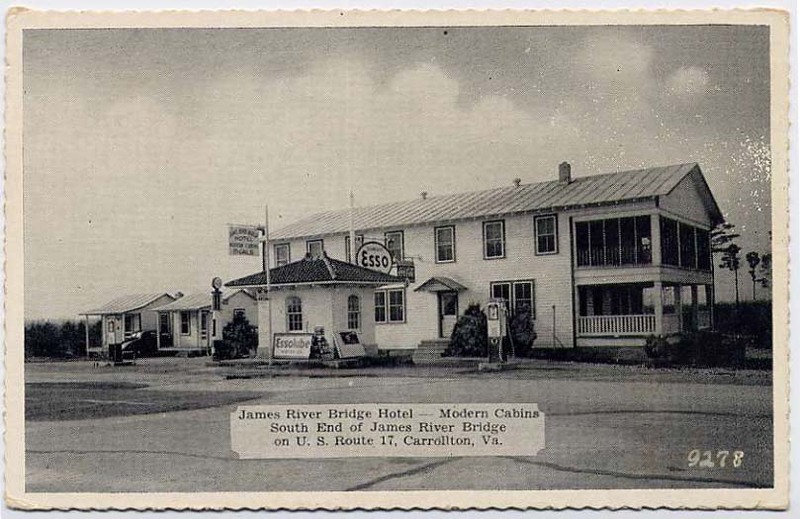 For a comparison, here is an image of a former Pure station in Lexington, VA. 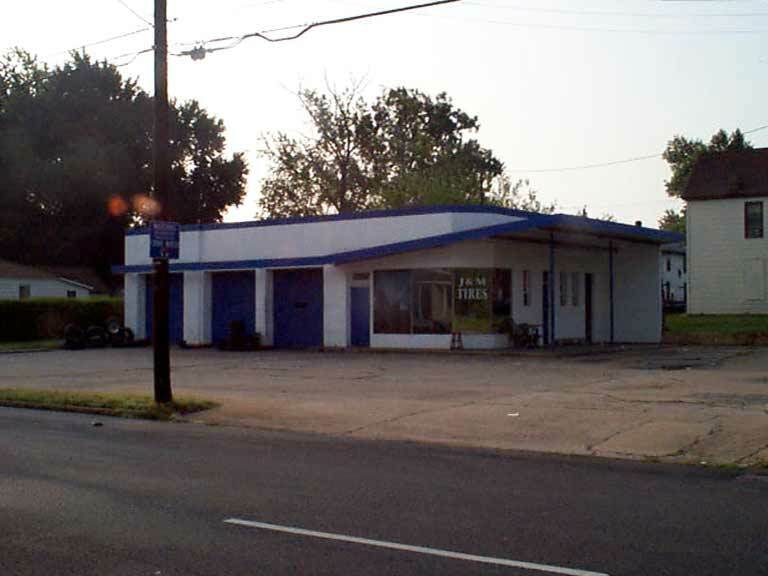 Here is the old brick gas station in Hilton. 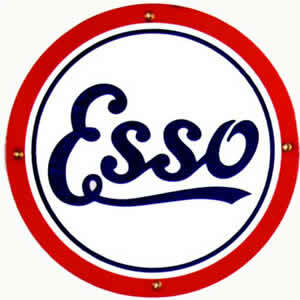 I can't recall what brand it was, perhaps Esso/Exxon. 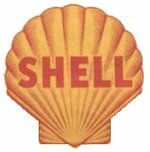 which we still associate with that brand. 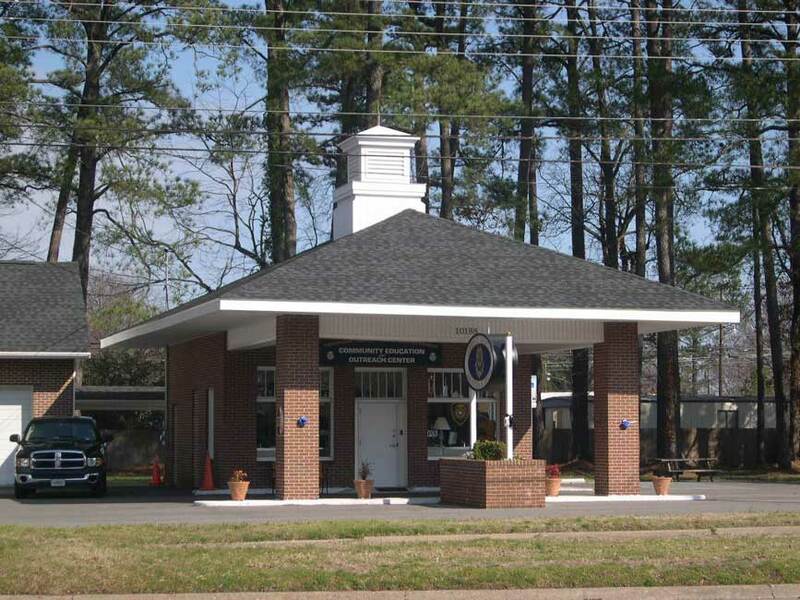 The old brick gas station in Hilton was an Amoco Station and was owned and attended by Mr. Adams, a lovely Southern gentleman that would personally take care of special customers. When driving back from Newport News to Raleigh, he always came out and greeted me with, "Hey there, Miss Carolina." He knew I was from Newport News but liked to tease. "Oh, I know you ain't from Carolina, but that's where you're going, and I ain't going to let you go with dirty windows." He passed away some years ago, not too many, but I sure do miss his friendly greeting and send off on my way back to North Cacklacky ! The station was right next to Ray Adams' "Hilton Country Club" where I used to go and shoot pool on the days when I had time, always in a skirt and high heels, with my own cue...what happy memories ! I sent the Hilton Gas station photo to three former Hiltonites. All three grew up on River Road, just south of Cedar Lane. They are younger than I, but old enough to have ridden the streetcar to NN. I think Jeff Walker's comment probably IDs the station brand. 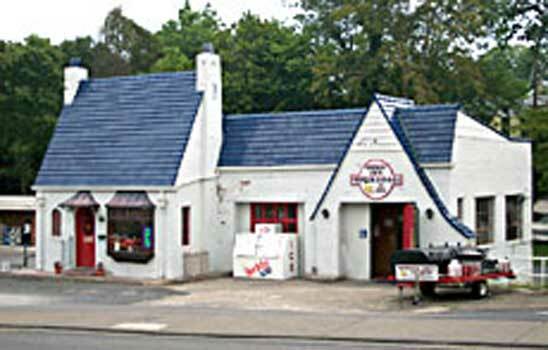 The old station on the SE corner of Pear and 25th was of the 1920's style with the building's roof extended out over the pumps. W. W. Sims owned the station, along with a coal and wood business (located elsewhere). If you ever photograph that station I can add a few recollections. 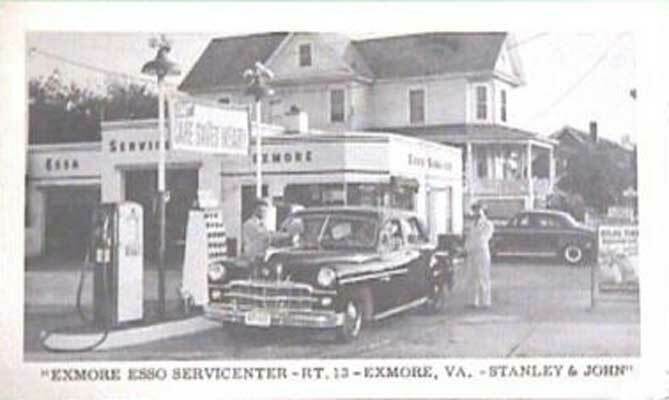 I can vaguely remember gas pumps changing over the years. The very oldest were purely manual. A lever was pumped back and forth until the desired amount appeared in the glass tank at the top (which had lines like a measuring cup). Then a control was turned and the gas drained into the car by gravity feed. I only saw a couple of these during visits to Gloucester Co. in the early 1930s (the county was very late getting electricity). On our peninsula I only remember electric pumps. However the early ones still had the glass tanks at the top. 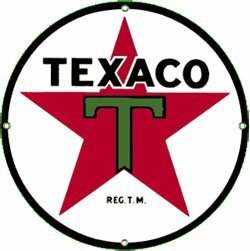 I can't remember just how it worked but I think even after the numerical displays were on the pump one could still see the gas slopping around in a glass tank. I have to admit that in those tender years I was more interested in sniffing the gas than watching it delivered. Eventually the glass tanks were phased out and numerical displays took over. There was some way of programming the feed so that it stopped at a certain total. 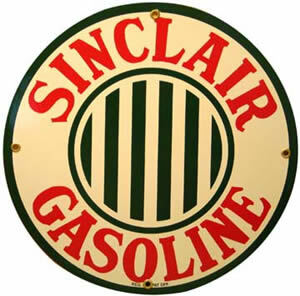 Most stations had a special dollar price such as "Six gallons for a dollar." This persisted for a long time until the price of gas got so high that a dollar didn't buy enough. By the time the glass tanks were gone the pumps were being topped with glass globes. 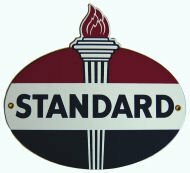 These had the brand name prominently displayed and were usually lighted with an internal electric bulb. 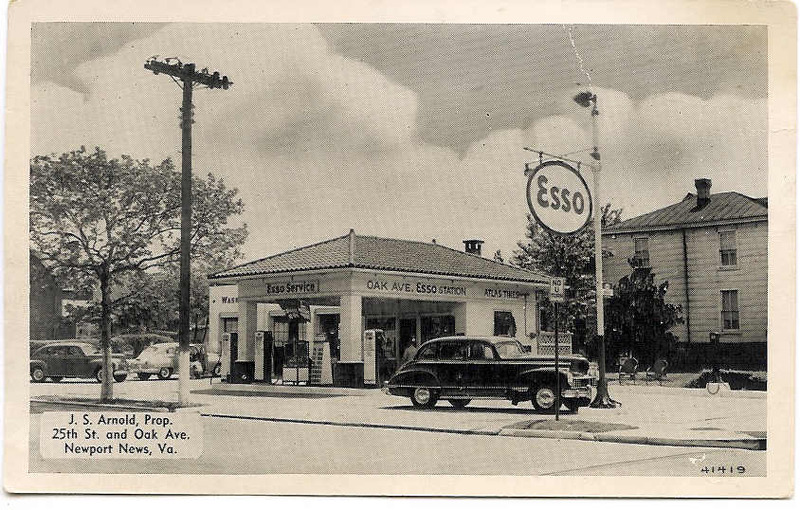 In the Boulevard and Wythe districts the service stations were all located along Kecoughtan Rd. (eventually the NN segment received 25th St. signs). Bread, soft drinks, candy, and a limited supply of staples were usually available. I was sent to Sim's Service station a million times. They stocked my father's favorite bread, Betty Lewis, which was baked in NN and delivered in the afternoon. He always admonished me to "feel the loaves and get a a warm one." Sometimes he would have me get a pack of cigarettes or a bottle of Sunshine Beer (10 cents a bottle). There was never any hesitation about selling these to a ten-year-old boy. 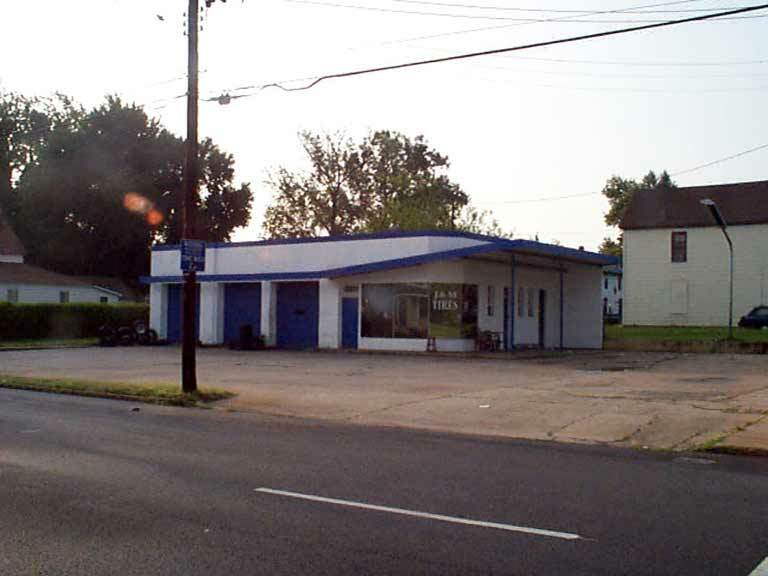 This is a recent photo of a former gas station in Hilton. The sign says "Community Education Outreach Center." 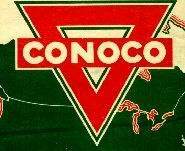 I guess they ran out of AMOCO gas!!! Thanks so much, Fred - and Jeff! than the stations, but they have new significance. 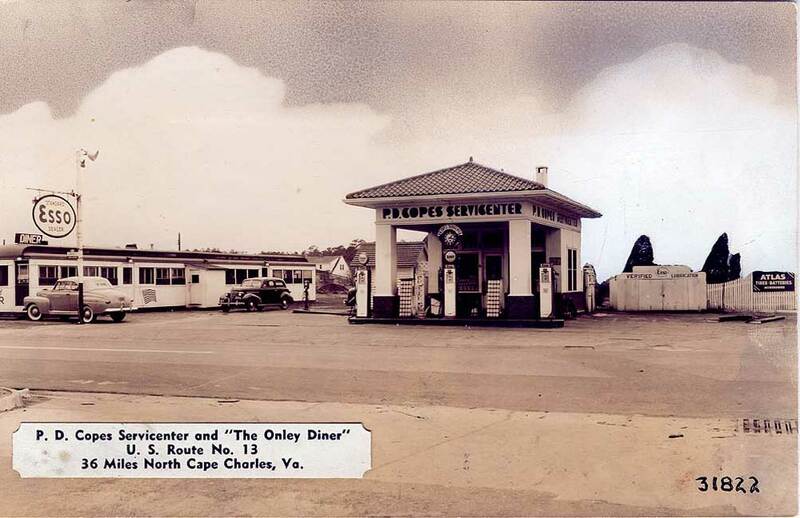 P. D. Copes Servicenter and "The Onley Diner"
36 Miles North Cape Charles, Va.
on U. S. Route 17, Carrollton, VA"